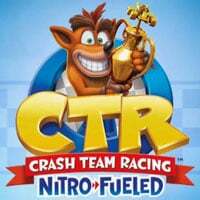 Nitro-Fueled is the subtitle of the remake of the cult CTR: Crash Team Racing. Behind the creation of this production is the Beenox team, while its release was taken care of by Activision Blizzard. In the Crash Team Racing Nitro-Fueled, the title character and his biggest rival, Dr. Neo Cortex, take on the glove thrown by the best racing driver in the universe, Nitrous Oxide. This threatened that if none of the earthly competitors manages to beat him on the track, he would turn the planet into a huge car park and make its inhabitants subordinates. As we play at Crash Team Racing Nitro-Fueled, we take part in crazy races on a variety of tracks. The authors provide us with a wide range of characters and vehicles. Although the knowledge of the tracks is very useful, success is mainly ensured by mastering the dexterity model of driving and skillful use of various power-ups. The list of the latter includes self-guiding rockets, explosive boxes, a shield or acid bottles. Compared to the original, the title can boast of the presence of additional go-karts and previously unseen routes. In the Crash Team Racing Nitro-Fueled a wide range of gameplay variants await the test. Players can try their hand at Adventure mode, put their skills to the test in Time Trial and Arcade modules, and compete with other players in VS and Battle modes. Contrary to the original, the production allows for multiplayer fun not only on a split screen, but also via the Internet. Crash Team Racing Nitro-Fueled boasts a thoroughly refreshed audiovisual layer, whose level of workmanship brings to mind earlier remakes and signed with Activision Blizzard's logo, namely Crash Bandicoot N. Sane Trilogy and Spyro Reignited Trilogy.